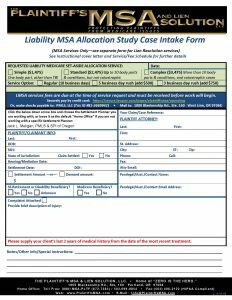 A Liability Medicare Set-Aside (LMSA) is an amount a Medicare plaintiff voluntarily reserves from settlement for injury-related, Medicare-allowable healthcare expenses. Why consider it? Medicare can decide that the entire settlement amount must be spent on incident or accident-related medical bills before they pay one thin dime. Don’t let this be you. While not (yet) legally necessary, CMS officials have stated that LMSAs appear to be a good option. In fact, drafting by qualified medical professionals ensures an amount that is much, much less than spending the entire settlement. A voluntary LMSA also caps exposure to Medicare at a fraction of the entire settlement. Thus, limiting what Medicare-allowable costs can claim. An outside legal opinion from a top Medicare attorney may reduce your client’s LMSA even further. The result? More for your clients, less for Medicare.